Eight more journalists working on Newsquest newspapers are at risk of redundancy, it has been announced. 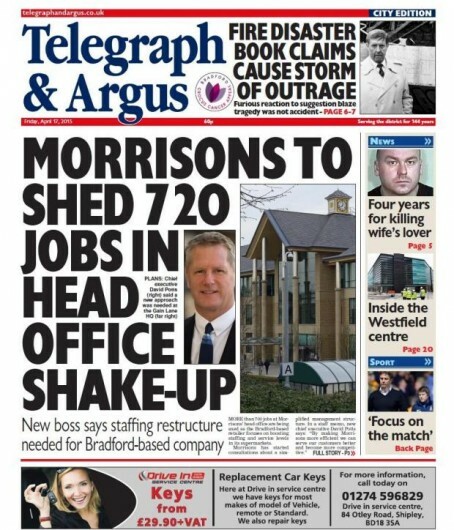 Five newsdesk staff at the Bradford Telegraph & Argus are set to be cut to three, while three senior staff working on the Craven Herald and Ilkley Gazette will be reduced to two under proposals by the company. It is the latest in a series of job cuts announcements made by the regional publisher in recent days, including four editorial job losses at Darlington and four in Gloucestershire. In addition a voluntary redundancy scheme has been opened at the Isle of Wight County Press while 20 advertisement creation roles are also understood to be under threat in North Wales. In October the head of Newsquest Bradford’s advertising operations, Sarah Kitson, left the company and Jane Hanson assumed responsibility for Bradford as advertisement director, in addition to her responsibilities with Newsquest in York. Newsquest is currently consulting with its driving staff over the possible transfer of newspaper deliveries to Menzies, but no roles are at risk of redundancy as a result of this proposed transfer. Newsquest has again insisted the announcements are individual business decisions taken locally, rather than part of an ongoing group-wide programme of cutbacks. A spokesman for the company said: “We continue to look for ways to run our business more efficiently in order to ensure that our titles have a sustainable cost structure for the future. “Due to advancements in technology, many of these efficiency savings will be made in content management and editorial production roles. Yesterday HTFP reported that three newsdesk positions at the Northern Echo in Darlington will be reduced to one, while one of two copy editor roles working on associated weekly titles the Darlington & Stockton Times and the Despatch series is also under threat. Here we go again, another day another announcement of staff cutbacks and job losses at NQ. And they really expect us to believe this isn’t part of a company wide slash and burn directive of shedding staff by year end rather than a few odd local savings, they must think we’re idiots, this is now the fourth announcement of job cuts and redundancies in as many days this week alone which when added up will mean a large number of staff being made redundant just in time for Christmas. Words fail me after 50 years as a journalist. Five news desk staff at Bradford to be cut – my old paper – have they found the dog yet to put it together. More and more jobs lost through Newsquests nationwide policy of reducing the FTE head counts by year end which shows just how desperate things must be if they pretend it’s nothing more than local ‘chiefs’ Cutting out the odd position or two and not a nationwide plan of job cuts. Newsquest must believe we really are stupid. They claim all these incessant redudancy decisions are made ‘locally’ – as if there is some kind of choice and considered thinking in the matter by those on the ground. The Newsquest template is sack almost everybody, leaving only a skeleton reporting crew for cut and paste duties. They must thing they are cunningly distancing themselves from all the corporate slaughter. Sorry Baldrakes, it just doesn’t wash – and you should be ashamed for expecting us to believe it. The same company whose ceo bragged it would be the top local media publisher by 2017, hilarious when you see how bad things are there now. This weeks many Newsquest job cuts annonvennts must go down as amongst the most incompetent and poorly handled redundancy announcements ever. To try to brush this off as a few local papers making the odd job cut when it’s quite obviously a top down directive from NQHQ is an insult to those people who are being shown the door. At least if they’d been upfront and honest about if they might have come out if this with some credibility in tact, instead they’re being seen as not having the courage of their convictions and making light of what will be a situation in which many people will soon find themselves jobless. If they want to make savings sack the person responsible for this major PR faux pas. Newsdesk numbers at the T&A appear to have swollen recently – not that long ago it was three, wasn’t it? Now bulked out to cope with online duties, I expect. But isn’t this the Newsquest way? create the jobs until a new system settles in, then pull the rug. Remember the subbing hub…. Does any former Newsquest staffer have happy memories of their time there, I wonder. I’ve yet to find one. Oh well at least its not as bad as 720 from Morrisons – no doubt the T&A PR chiefs are happy with HTFP’s inclusion of that splash. On a serious note though, it always fascinates me regarding the timing of these announcements. Why always Christmas? Can’t they at least let hardworking staff get the festivities out of the way first before dropping their bombshell? the timing is all to do with the forecasted end of year figures, once the full impact of the financial position year to date ( usually mid October and usually way off budget and way over with costs) the bean counters will issue a directive to limit the damage in a desperate attempt to make the full years figures less damaging than they might otherwise be, this usually results in kneee jerk panic measures; big bonus carrots dangled to the sales people to get extra money in, reducing full time staff head counts, merging job roles, closing titles and issuing redundancy notices to staff in positions they feel they can absolve, positions taken up by easily impressed inexperienced staffers who suddenly find themselves ‘ promoted ‘ to job titles and roles they wouldn’t normally be considered for and in positions way above their capabilities. reducing numbers and making cuts now means they can start the new year with fewer staff, less costs, albeit to the detriment of already weakened papers and news teams, and regardless of a lot of people finding themselves on the dole come the new year. While the relentless jobs carnage continues, and I share the disgust at the timings, I am also increasingly more fearful of the implications for local democracy. If it’s true that politics, like journalism, is fundamentally local, then we seem to be watching helplessly as the establishment flexes its self-interest muscles without fear of censure, and often supported by the national Press. Apart from expressions of concern and hand-wringing, there is no effective scrutiny of local democracy. In 2009, the Press Association tried to pilot a “public service reporting” project on the grounds that the coverage of public institutions had diminished with a consequent impact on democratic engagement. In November 2014, the NUJ wrote to culture and digital economy minister, Ed Vaizey, calling for a short, sharp inquiry into the future of local newspapers. In 2015, the BBC released its controversial report arguing that the BBC should fill the information vacuum in the regions caused by the “retreat of commercially-owned newspapers”. There’s probably another report gathering dust somewhere since then, but you get my drift. Meanwhile, two thirds of local authorities are not served by local newspapers; 40 per cent of local authorities in England, Scotland and Wales have only one commercial publisher responsible for their print circulation; council meetings, courts, go unreported, etc. The importance of local decision-taking and accountability has been seriously downgraded. And don’t anybody tell me that social media is now the public watchdog. I have even been told this by senior commercial directors where I am , it’s all about reducing the damage done by the accrued losses during the year in lost ad revenue and lost copy sales and reducing overheads,nothing to do with it being the Christmas period or the effect this will have on the staff being made redundant, that’s of no concern to those making the decisions or the weak managers who sit back and allow it to happen, it’s all about how the business looks on paper against their projected forecasts to the shareholders and about the ones higher up the pole saving their own skins.